Intent on creating equal opportunities for individuals from all walks of life, irrespective of gender, race, ability or background; Chickenshed’s all inclusive ethos has seen the company’s popularity grow, gathering many a high profile fan along the way including the late Princess Diana. With a repertoire spanning over four decades, Chickenshed Theatre faced the mighty task of deciding which shows would make the final overall production! The selection process, which commenced just over a year ago, involved the input of 100s of ensemble members, audience members and the staff working behind the scenes. Once the shortlist had been drawn up, it was a case of showcasing the very of the theatre company’s repertoire, as well as shining a light on the multi-talented cast members. An array of projectors, alternately angled became the initial focal point of the show as the company’s ethos became the overriding sentiment. Quotes from well know individuals, including the likes of Simon Callow created a continuous wallpaper of the company’s achievements. The symbolic shed set centre stage, which held key props such as a Jamaican Flag, to a Director’s chair, was gracefully deconstructed by the ensemble, the props also taken away. 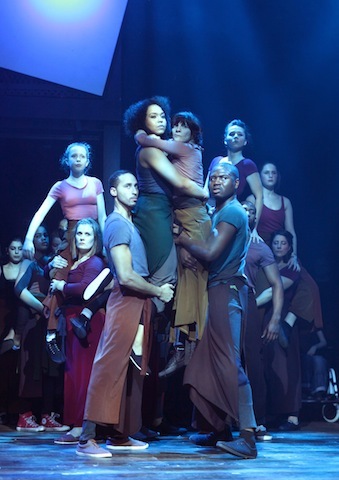 A beautiful metaphorical statement of how Chickenshed’s values of equality shape all of their performances and a clever way of displaying the Theatre Company’s chronology as each prop became an emblem for shows of both the past and present. Act 1 well and truly got the celebrations underway as both Prince and Princesses (2006) and Wedding Dance (1990) transformed the stage into an exuberant spectacle, as Christine Niering‘s powerful Chechan choreography dazzled. Dressed in traditional red Chechan folk dance attire, the cast dynamically encompassed the stage, travelling in circles and line formations whilst continually staying connected with arms around each others shoulders. Wedding Dance gracefully changed the pace of the former routine, as the performance revolved around two protagonists. The cast, in duets watched on as the loving couple performed their first dance, each pair going up to the couple to congratulate them. Bearing in mind that it’s not only the Chickenshed that celebrate a landmark birthday,but also Shakespeare’s 450th birthday this year, Chickenshed’s production of A Midsummer Night’s Dream (1996) entertained and amused, from an elvis inspired impersonator, to a pink wig wearing male, who decides roller skating around is the ideal characteristic of his role of female heroin. Lay Down My head (1989) was a thought provoking piece of choreography. With sentiments ringing from the speakers of ‘Peace is a World without war’, the cast gracefully and profoundly worked together to create still moments of community. Transitioning from duet, to duet; a range of shapes and lifts transformed the stage into a range of different possibilities. Each tableaux a narrative within itself. A poignant piece of theatre that nearly moved me to tears. Cirque Freefall (2002) brought an air of insanity and chaos to the evening, as the techo/rock inspired soundtrack accompanied the acrobatics and the sudden and stoccatto nature of the choreography. A piece looking at the low wages of factory workers worldwide, the performance culminated in the cast relentlessly attempting to climb, swing and escape away from the two metallic scaffolding boxes set centre stage. Act 2 continued with the bold and vibrant nature of the first with a radiant performance of The King’s Web (1995). Starting off with a small group of performers, the stage gradually filled with many cast members by the shows conclusion. A bright and lively performance bringing an air of sunshine to the evening. Never afraid to tackle the societal issues that face us today, “as the mother of a brown boy ” (2007) evoked and educated. A sad tale of institutional racism and it’s consequences, the piece smartly incorporated the use of initially blank canvased boxes that would then become a means for projections to be displayed. Anancy (1988) brought back that feeling of community, as the protagonist tirelessly fought for the rights of the people in Jamaica with the use of music, dance and history. Apartheid (2012) was a performance adamant on showing the importance of equality, and also showing that sense of community with poetry and dance. A wide range of issues, showing the Chickenshed’s devotion to keeping up to date with the various goings on of the world.